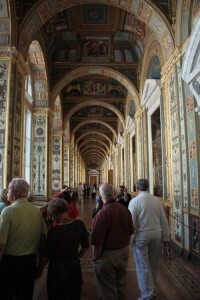 If you’ve ever been to The Louvre in Paris and experienced the sad letdown of not being able to get within five feet of Leonardo da Vinci’s Mona Lisa, you will find The Hermitage in St. Petersburg, Russia, at once a little refreshing and a bit frightening. 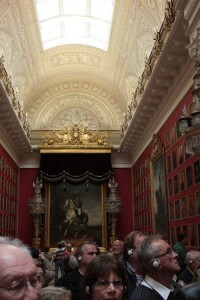 This state museum located in the former Winter Palace of the tsars houses some of the world’s greatest works of art and gives you a rare opportunity to get within what I hate to point out is almost touching distance of them. 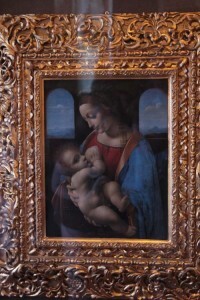 You can literally stand within a foot of Leonard da Vinci’s Madonna With Child, Raphael’s The Holy Family, and Rembrandt’s Portrait of an Old Man. Well, Russia seems to carry enough vestiges of communism to make art accessible to the people even at the risk of its preservation, i.e. flash bulbs blasting away at centuries-old paintings and the foot traffic of millions stirring up dust and grime. That being said, I still found it a bit titillating to come so close to the masters…. If you have the good (or perhaps bad, depending on how you look at it) fortune of jumping all the hurdles required to gain entry to Russia these days, you might want to schedule your St. Petersburg visit for winter. In summer, cruise ships by the dozen call on this former Russian capital, unleashing tourists by the tens of thousands on the city’s palaces, museums, and cathedrals. Hang on tight to the little ones, and don’t let your hubby out of your sight for a second. The crowds here are enormous. 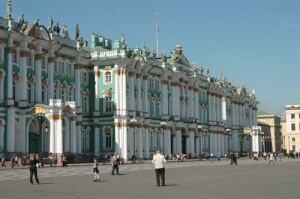 That being said, The Hermitage is still worth a visit no matter the season. Its ornate baroque design, its sheer immensity (its exterior facades measure over 600 feet), and the grandeur of its interiors (not to mention the art) make it a destination not to be skipped. Just realize it would take you nearly a decade to fully explore the museum, which houses 365 rooms of exhibits and nearly three million works of art. If you have a day or less (as I did), the second floor of The Hermitage is a good place to focus, providing access to the Hall of Mirrors, a stunning reflection of Versailles; Pavilion Hall with its Moorish and Renaissance decor; and the works of Michelangelo, Rembrandt, and Renoir. Beware the babushkas, however. These tight-lipped ladies never hesitate to keep wayward visitors in line, and their looks alone will make you think twice before getting too close to that painting of Rubens…. Thanks for sharing this part of your trip, Deborah! The pics are great and I’m still sooo jealous. Thanks for checking out my travel blog. I hope to post some more pics from St. Petersburg in the next few days, so stay tuned. The architecture was simply amazing!